I have always heard that good things come to those who wait, and more often than not this adage is correct. Fortunately is also true for the folks that have been waiting a dozen years for Tommy Malone to release a follow-up to his debut solo album. His fans (and his soon to be new fans) will not be disappointed that it took so long. Tommy Malone is one of the unsung heroes of the music industry, and he has been writing, playing and singing roots and blues music for more than three decades. You may know him from his association with various Louisiana-based bands, most famously the Subdudes. You may not know that his songwriting is highly regarded, and his tunes have been recorded by artists such as the Radiators (his brother’s band) and Joe Cocker. He grew up in Louisiana, and recently returned to New Orleans after spending five years in Nashville. His latest effort, Natural Born Days, was recorded in New Orleans and is a wonderful product of a lot of great people. It has a dozen tracks, all of them originals, and Malone collaborated with his old buddy, Jim Scheurich, on half of them. His Subdudes bandmates, Johnny Allen and Tim Cook helped out on the writing chores as well. It was produced and mixed by John Porter, a 10-time Grammy award winner who has worked B.B. King, Buddy Guy, the Smiths, Bryan Ferry, Carlos Santana, and many others. He also contributed some of the guitar, bass, mandolin and percussion parts. The rest of the musicians are from New Orleans, including Susan Cowsill with the background vocals, Jon Cleary on keys, Doug Belote on drums, bassman David Hyde, Joe Gelini on percussion and Shane Theriot on guitar and omnichord. “Home” is the first track up, and it is a short swamp blues rocker that tells the wonderful story of Tommy’s return to his hometown five years after Hurricane Katrina drove him away. His voice is well-weathered but his joy shines through as he details the vibe of the Crescent City. There is a lot going on in this song, from pretty vocal harmonies to Hyde’s fat bass line and Cleary’s hammering honky-tonk piano. It all fits together very well, which is not a fluke as the rest of the album is equally well put together. The theme to “God Knows” could be a real downer, as it deals with the mysteries of why things work out so badly sometimes, but Tommy balances it out by looking at the unexplained goodness in our world too. I can only think that this is a result of his personal experiences with the aftermath of Katrina. This slow-paced rhythm and blues number features Nigel Hall on the Hammond and the Wurlitzer electric piano, and he does a masterful job of not going over the top, which would surely be a temptation on a song like this. Malone included a little something for his diehard fans too, recording “Didn’t Want to Hear It,” a ballad he has been playing at his live shows for years. He does some fine acoustic guitar work here, and it is surprising that he does not show this off more on Natural Born Days, as he is a fabulous musician. As it is, his maturity and restraint are to be commended, as he lets the songs be more about the lyrics instead of what he can do with his fingers. 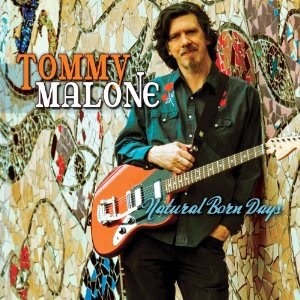 The title track of Natural Born Days is a touching tribute to Malone’s mother; it brought a tear to my eye the first time I listened closely to the lyrics as he paints such a realistic and loving picture with his words. It is in a country/funk style, with subdued slide guitar and a hint of Hammond B3, both of which have a symbiotic result when used together. The final cut is “Word on the Street,” a soulful ballad with an arrangement that is a bit more sparse than the rest of the tracks. The listener is able to focus on the lyrics because of this, and wonder what became of this unfinished love story. This is a great final chapter, and left me more than a little curious about what Malone will come up with next. I listen to a lot of new music and Natural Born Days is perhaps the best new album I have heard in the past year. It is obvious that Tommy Malone put his heart and soul out there for the world to see, and he should be commended for his talent and honesty. I hope you take the time to give it a listen; it will be worth it.